The Tamerica 210PB Plastic Comb Binding Machine is a fully-featured Manual Comb Binding System that punches sheets up to 12" in length and bind books up to 2" thick. The 210PB is manufactured with all metal construction, 4-Position punching depth adjustment, 21-disengageable dies to allow for all sheet sizes up to 12" in length, and hollow ground self-sharpening dies. In addition to all of these great features the 210PB also includes a 2 year factory warranty which helps to set it apart from its competitors. The 210PB is fully compatible with all of the plastic comb binding supplies, GBC ZipBind Spines and binding covers carried by Mybinding.com. Compatible with Combs from 3/16" - 2"
21 Fully disengageable dies for custom sheet sizes. I LOVE this binding machine. I've never done any binding before and it was easy to get going (took me about 10 minutes to attach the handle, figure out where my paper fit best, and make a few trials and I was on my way. It's quick and easy! This has saved me a TON of money. I like the disengaging dies - especially handy for what I need to bind. And sales and service at MyBinding.com was superb. Thank you! I highly recommend this machine. It is a tool that makes it easier to bind texts, school projects, as well as calendars. However, being left-handed, the process takes a little bit longer to accomplish. It would be a step in the correct direction for the company to fabricate a left or right handed version of this tool thus giving the operator the option to affix the handle to the side that allows for the greatest ease of operation. This is the first binding machine I have ever used and I am VERY please with how well it is built, the flexibility of functions and the ease of use. I bound my first book on the first try using a 1-3/4" binding comb ! I am a braille transcriber and needed a good binding machine for putting together braille documents and books. Braille paper is quite heavy and I was concerned about the machine's ability to punch through multiple braille pages at once. Not only did the machine punch it quite easily, the holes were cleanly cut making the pages easy to weave onto the combs. There was no sign of punch residue in any of the 19 holes on the braille paper when I finished. Having the ability to set the binding cuts further in from the edge of the paper is also very important in my work to help prevent the braille paper from tearing off the binding comb. Great machine! Well worth the money. It works better than I expected. Makes quick work of the project. Solid machine, works as advertised; easy to use for a first timer. made of metal-not plastic. works great! I was looking for a solidly-built comb-binding machine capable of variable punch depth and selective die cancellation. The Tamerica 210PB features metal construction, with all of the expected adjustments. The price is reasonable, and I heartily recommed this machine when demand does not call for a motirized punch. Four Stars Review by Lawrence M.
Really great machine, easy to use. Welcome to MyBinding video. 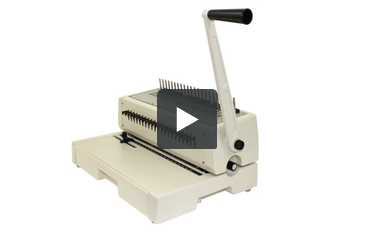 Today we’re looking at the Tamerica/Tashin 210PB Plastic Comb Binding Machine. Let’s watch it work and see just how simple it is to bind a book. With all of your materials gathered together, let’s begin with the covers. Place the covers face down and use the side margin control knob to assure that all papers are punched in the same spot by selecting your size and locking it down. On the left side of the machine is an adjustable depth of margin punch control knob. This will assure that you have control as to how far you want to punch in from the margin of the paper. Continue to punch the rest of your pages until all of your papers are done. With the fully disengageable punching pins along the front end, it’s possible to prevent any one of the holes from punching. This enables accurate punching for different size papers or different orientation. When your entire project is punched, you’re ready for the binding. The same metal lever that’s used for punching is also used for opening the comb. Simply place the plastic comb over the teeth on the top, lean the lever toward the back to open the teeth of the comb, and thread on your project. In comb binding, always remember to keep the teeth faced up and the project faced down; that way the booklet doesn’t fall apart when in use. Finally, drop the lever to close the comb and you are all set. It’s that simple with the Tamerica/Tashin 210PB Plastic Comb Binding Machine. For more demos and reviews of this product and many more, check out MyBinding.com. Although the Tamerica 210PB is a relative newcomer to the market, it has begun to give some of the other machines that are available on the market a run for their money. On the surface, it appears to be built well and have a number of features that are not common to other machines in its price range. This review will take a look at a few of those features and will help you to evaluate the strengths and weaknesses of this machine. The Tashin 210PB has a number of features that set it apart from other similarly priced comb binding machines on the market. It has an adjustable depth of punch margin control that allows you to choose the distance between the edge of the paper and the holes that the machine produces. If you are using very small sized plastic combs you will need to set the holes so that they are close to the edge of the Savepaper. This will help to ensure that the pages turn freely when you open your document. When using very large sized spines you will need to set the holes so that they are further from the edge of the paper so that the weight of your document doesn’t cause the pages of the book to tear out. It has 21 fully disengageable punching pins. Using these disengageable dies, it is possible to prevent any one of the holes from punching. This allows you to bind half letter sized documents or letter sized documents in landscape orientation. It can also allow you to punch documents that are longer than 11″ in length using a two step punching process. If you want to punch longer documents you simply need to punch one end of the document and then flip it over to complete the punching pattern. The 210 PB also includes high quality hollow ground self sharpening steel punching pins. These pins will allow you to punch approximately fifteen sheets at a time. Under normal conditions, this type of punching pin should last for 10 or 20 years. However, like all comb binding machines, you should be careful when punching clear covers. No more than two clear binding covers should be punched at a time. The Tamerica 210PB also includes a high quality metal comb opener that is capable of opening combs that are as small as 3/16″ and as large as 2″ in diameter. The comb opener is operated in conjunction with the punching mechanism of the machine. The fact that the comb opener moves at the same time as the punch means that the machine can be placed against a wall or in a tight space (some machines require you to push the handle back to open the combs). However, this type of design can cause the comb opener to wear out faster than on a machine where the mechanisms are operated separately. Although it is not the most sleek or stylish looking machine on the market, the 210PB is extremely well built. With the exception of the handle grip and the margin guide, the whole machine is made of metal. This means that the 210PB will hold up extremely well under normal conditions. It is great for a school or office environment where a number of different users will use the machine. It also comes with a two year warranty which is twice the warranty that comes with most other comparable machines on the market. That being said, the chances you will need the warranty are pretty slim. Although the 210PB isn’t the most stylish comb binding machine on the market it is built well and includes all of the features that you will need to bind both large and small documents. Plus, the additional one year warranty should help to give you peace of mind that the machine will last for years even if you use it regularly. It is an excellent choice for small and medium sized companies as well as schools. However, high volume users will most likely find the manual punching mechanism to be tedious. If you need to bind a lot of documents with plastic combs, you will probably want to consider a similar machine with an electric punching mechanism. The depth adjuster is stuck on depth 1 on the right side of the machine -- it won't budge. There is an unmarked knob on the left side that will move, but nothing to adjust the depth. Thank you for your question. I am sorry to hear you are having issues with your 210PB. To address technical issues the best first step is to contact the manufacturer's technical support department. The manufacturer is Tamerica and their phone number is 800-822-6555..
Can this machine hold more than 200 sheet if use a bigger comb? Thank you for your question. The Tamerica / Tashin 210PB Plastic Comb Binding Machine is able to use the full range of combs up to the 2 " size shich can hold up to 425 sheets of 20# paper. Thank you for your question. The Tamerica / Tashin 210PB Plastic Comb Binding Machine weighs 20 lbs. I want to bind music books which are 12 inches on bound side. Will A4 21 hole combs work or do I need to order custom length combs? Thank you for your question. The 21 hole/loop comb spines would work with a 12" binding edge. A4 paper is 11.7" long, the comb would be a bit smaller than the 12" length but would be functional. You can punch a sample 12" length to see the balance of 21 vs 22 or 23 holes from a custom punch. how many pieces of paper can I punch at a time? I need to put a sin on our new machine as this is what broke our old one was people trying to punch to many pieces at a time. Thank you for your question. The Tamerica / Tashin 210PB Plastic Comb Binding Machine is able to punch up to 20 sheets of standard 20# copier paper. If you are using a thicker stock you would want to punch a few less sheets at a time. A good rule of thumb is if you are having to put a lot of effort into punching your stack of paper you are using too many sheets. Thank you for your question. Ibico made several models of comb binding machines. The Tamerica / Tashin 210PB is a solid binding machine that can use the full range of binding comb up to 2". The Tamerica / Tashin 210PB has fully disengagable so you never have to worry about half punches on the edges of the page. Will this machine bind 8 1/2 inch spine or landscape format? The Tamerica / Tashin 210PB Plastic Comb Binding Machine can bind up to a 12" length spine.